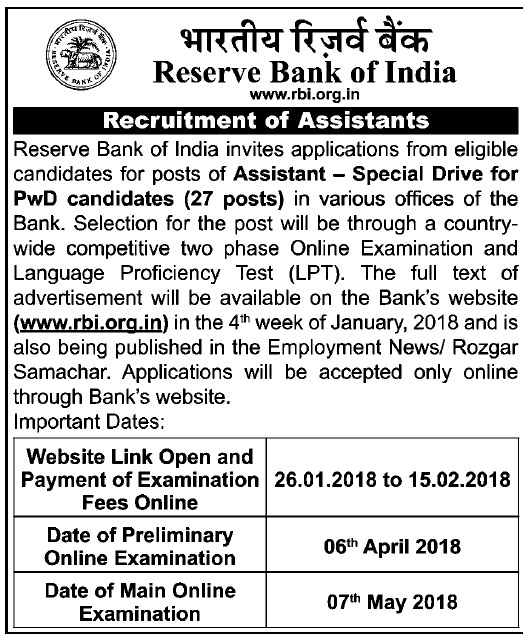 Reserve Bank of India invites applications from eligible candidates for posts of Assistant — Special Drive for PwD candidates (27 posts) in various offices of the Bank. Selection for the post will be through a country-wide competitive two phase Online Examination and Language Proficiency Test (LPT). Age : Candidates age should be between 20 to 28 years as on 01-01-2018 i.e. Candidates must have been born not earlier than 02-01-1990 and not later than 01-02-1998 (both days including). Upper age relaxation is applicable by 05 years for SC/ ST, 03 years for OBC, 10 years for PWD candidates & other as per rules. Educational Qualification: Candidates should possess Bachelors Degree in any discipline with knowledge of word processing on PC. Selection Process: Candidates will be selected based on preliminary exam, . Language Proficiency Test & main exam. Application Fee: No fee is payable for the candidates applying for the post except the intimation charges (Non- Refundable) of Rs. 50/-. Staff candidates are exempted from payment of intimation charges. How to Apply: Eligible candidates may apply online through the website www.rbi.org.in from 30-01-2018 to 19-02-2018.